The Covenanter Bookshop, Cameron House, 98 Lisburn Road, Belfast BT9 6AG. Session and Congregational Committee of Dromara Reformed Presbyterian Church. R.P. Manse, 38 Hillsborough Road, Dromara, Dromore, Co. Down. The Ministry of the Rev. Wm. Warnock, B.A. The Ministry of the Rev. Alexander Gilmour, M.A. The Ministry of the Rev. J. Renwick Wright, B.A. The Ministry of the Rev. Robert Hanna, B.A. I have pleasure in writing this short foreword to the Rev. 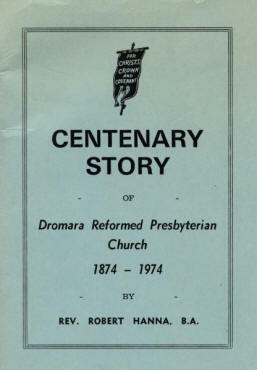 Robert Hanna's "Centenary Story of Dromara Reformed Presbyterian Church". Mr. Hanna has told the story in a sympathetic and enthusiastic manner. He has gathered his facts from a wide variety of source material and has done good work in presenting them clearly and concisely in a story that is full of interest. The present generation of members in Dromara have reason to feel grateful to him for this faithful record of events, and a rising generation will in turn be inspired to follow the faith and emulate the deeds of illustrious forebears. The congregation that was born in adversity has grown to maturity and takes its rightful place in leadership in a community where its testimony and integrity are highly respected. This reflects great credit on the sincerity and industry of succeeding generations of faithful men and women. The name of Dromara is held in high esteem by the whole Covenanting Church on whose behalf I would extend warm congratulations on the attainment of this notable anniversary, with the prayer that continuing loyalty and faithfulness on the part of pastor and people may lead to still greater days of blessing from the hands of a Covenant God.